Alan Alexandroff and Arthur Stein reflect on Graham Allison’s use of the ‘Thucydides Trap’ to assess the state of US-China relations. The US-China relationship has been of growing concern and, in some cases, of intense alarm. What is the best way to capture the relationship between today’s two great powers, the United States and China? And how does such an understanding guide and shape our policy; and does it promote or discourage the likelihood of conflict between these two great powers? Professor Allison’s new book, Destined for War: Can America and China Escape Thucydides’s Trap? will be released shortly and encourage experts and policy makers alike, as he has for some time now, to examine the dynamic of US-China relations through the ‘Thucydides Trap’. But the question remains, what are the implications for examining US-China relations in this way? How helpful can this understanding of international relations be in grasping US-China relations today? Allison’s appellation of the ‘Thucydides Trap’ is used as a metaphor and derives from the Athenian general’s history of, and explanation for, the war that resulted from the rivalry between Sparta and Athens some 2,400 years ago. Thucydides argued that the rapid rise of Athens and the fear that this created in Sparta was the true cause of the 30-year Peloponnesian War that ensued. International relations contains a number of explanations for understanding conflict in the international system. The dominant explanations are of two sorts – those that emphasize structure and those that emphasize agency. The Thucydides Trap falls primarily into the structural category and continues a line of work that argues that war is most likely when the international system experiences a power transition between a previously hegemonic power and a rising challenger. (1) Peace, according to the A.F.K Organski’s power transition theory (1968), is most likely when there is a dominant power – in other words where an imbalance of power exists in the system. A rising power that rapidly reduces the power imbalance, and also challenges the existing order, increases the prospect of conflict between the rising power and the dominant power. As Allison wrote previously in The Atlantic (2015), the structural stress caused by a rapid shift in the balance of power between two rivals makes conflict inevitable. It is worth a quick reference to the historical data that is raised to confirm the basic proposition: rising powers and status quo ones find themselves likely to engage in conflict as the status quo power resists the growing demands and rivalry of the rising power. 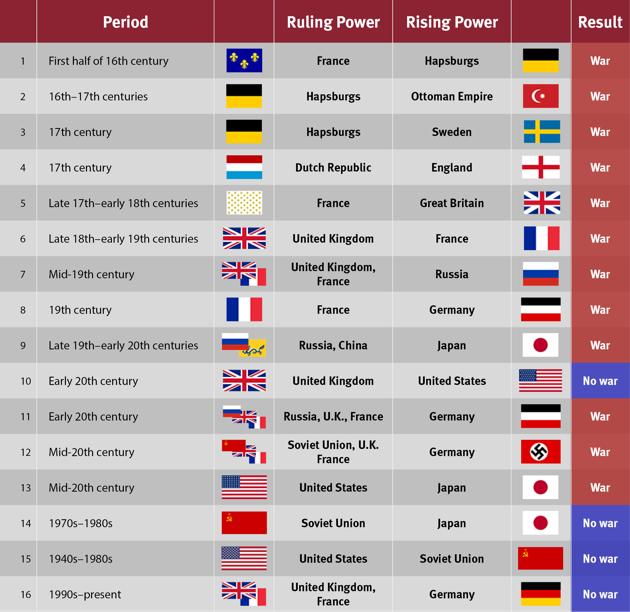 In their examination of the historical record (see list below) Allison and colleagues at the Belfer Center for Science and International Affairs at Harvard identified some 16 cases in the historical record that captured this international relations situation of a rising power and status quo power. From the list of Belfer cases in the figure, 12 of the 16 historical cases identified resulted in war, and in the modern cases led to devastating conflicts that killed millions and wiped countries and regimes from the geopolitical map. The historical record, in other words, appears to confirm the ‘Thucydides Trap’. Today, great power rivalry, moreover, is driven far less by the desire to enlarge territory and achieve national advancement through territorial gain. Indeed, it was a singular international relations insight of Rosecrance (1986) to see the rise of trading states. States that had previously sought territorial gain – Germany and Japan as examples, recognized following disastrous conflict that they could achieve economic prosperity and enlarge per capita wealth without the need for territorial aggrandizement: commerce had replaced conquest as a means for enhancing national wealth and influence. Rosecrance (2013) has also argued more recently that the preponderance of power that has the potential to tame conflict is embodied in alliances and not merely hegemonic powers. This raises a great power framing that differs markedly from the Thucydides Trap. In East Asia alone it is not just the United States competing with China but the US and its various allies including Japan and the Republic of Korea not to mention in the wider Asia Pacific, Australia and others. The US-China rivalry is not just a bipolar contest of a rising power and a status quo one as described in the Thucydides Trap, but of a status quo alliance that remains preponderant. Thus, the issue is not that great powers may not find themselves rivals and possibly even in conflict but that framing the competition in power and structural terms, while an appealing device, may in analytic terms represent a trap hindering better US-China relations. It is not that Allison does not see this, but by framing it in the structural terms of the Thucydides Trap, he risks that policy makers and experts will never see the policy options he suggests, based on what he describes as “a long pause for reflection.” In the end, it will be human agency that will resolve crises, devise formulas, and negotiate the understandings and agreements that will make it possible to navigate the political implications of changing power configurations. Alan S Alexandroff is the Director of the Global Summitry Project, Munk School of Global Affairs, University of Toronto and a Senior Editor for the journal, Global Summitry: Politics, Economics and Law in International Governance. Arthur A Stein is Professor of Political Science at UCLA. (1) Besides Allison’s Thucydides trap and Organski’s power transition theory, works that emphasize such power inflections include Charles Doran’s power preponderance theory, George Modelski’s long cycle theory, and Robert Gilpin’s hegemonic stability theory. (2) Rosecrance and Jia code the case of the United States and the Soviet Union as a case of conflict, but in Allison’s focus on war rather than conflict, this case is counted as“no war. Allison, Graham. 2015. “The Thucydides Trap: Are the US and China Headed for War?”, The Atlantic, September. Organski, A.F.K. 1968. World Politics. 2nd ed. New York: Knopf. Pempel, T.J. 2015. “Thucydides (Clap)Trap: US-China Relations in a Changing Asia-Pacific”, GlobalAsia, Vol. 10, No. 4 (Winter). Rosecrance, Richard. 1986. The Rise of the Trading State: Commerce and Conquest in the Modern World. New York: Basic Books. Rosecrance, Richard. 2013. The Resurgence of the West: How a Transatlantic Union Can Prevent War and Restore the United States and Europe. New Haven, CT: Yale University Press. Rosecrance, Richard and Jia Qingguo. 2009.“Delicately Poised: Are China and the US Heading for Conflict?”, GlobalAsia, Vol. 4, No. 4 (Winter).